Black and White Market House with Church Lane behind. 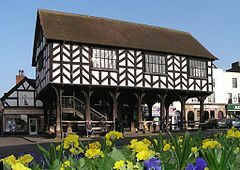 Welcome to Mrs Muffins' 4* Holiday Apartment situated in the heart of Ledbury - one of England's finest market towns. Sympathetically converted with guidance from local planning and English Heritage in 2010, this circa 17th century listed building has been brought back to life with a high quality project to create a living space that maximises the traditional features whilst adding touches of modern chic to produce a welcoming and comfortable ambience. There are many good eateries and bars on your doorstep, along with a wealth of independent shops and boutiques all a few strides from your private front door. The Apartment is a 10 minute walk from the railway station with direct trains to Malvern, Hereford, Worcester, Birmingham and London (and more). The M50 motorway is a 10 minute drive.